Warning – more than slightly wonkish! In this section, I want to focus on the technology behind the two cameras I currently use the most, the Fuji Z900EXR, and the Fuji F600EXR. 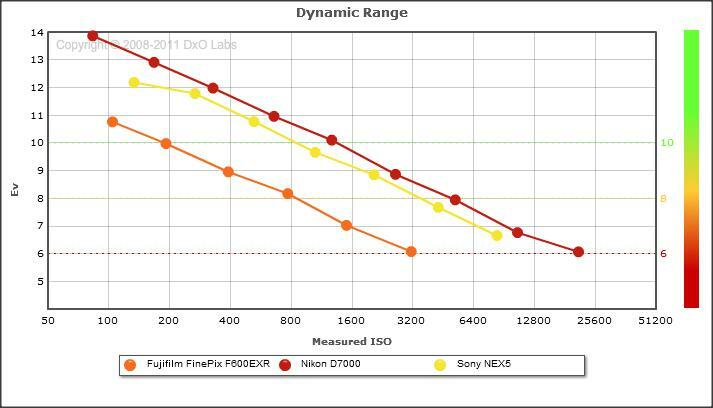 The EXR technology (who knows what it stands for), in principle gives them an advantage compared to other cameras. Whether it does or not in practice, we will see, but first here is an overview of what EXR is about. EXR is an attempt by Fuji to improve on their specialisation in low light and dynamic range, which they have majored on almost since their first entry into the market. While there are no vendor unique miracles in the sensor or processing technology (by and large), it is possible to play with the arrangement of the sensors. The pixels in a Digital Camera are laid out in all other cameras in a fairly regular grid,(the Bayer array) as shown on the left . Thanks to the excellent DPReview from where these images came. Note that there are more green pixels than blue or red because the human eye is more sensitive to green, so doubling up on these reduces the overall noise and improves detail. Fuji played with the standard array by rotating it by 45 degrees, and rearranging the grid to ensure that there are always two pixels of the same colour right next to each other. 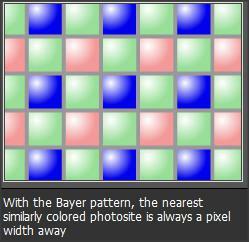 In the Bayer array, there is always for example a green pixel between two blue pixels (see above). It turns out that placing two pixels of the same colour next to each other allows you to do processing that can improve sensitivity, or increase dynamic range. Why? Because you can, when you need to, treat the two adjacent pixels as one ‘super pixel’. For improved dynamic range EXR cameras do a clever trick of taking two more or less simultaneous shots, using a different set of adjacent pixels each time. Each shot is at different exposures, and these are then combined into a single frame with improved dynamic range. While other cameras can bracket exposures, or automatically take successive bracketing shots, only EXR compact cameras can take a more or less instantaneous and completely automatic DR shot and do it in hardware. To get better low-light sensitivity, EXR cameras combine two adjacent pixels into one, a technique known as ‘pixel binning’. This is rare in digital compacts, and although it can be done, the Bayer sensor that all other cameras use, reduces colour accuracy and resolution. 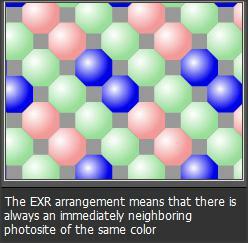 The effect of the EXR technology is therefore to give the output performance of a much larger sensor. Why not just have a larger sensor? Well for me the main reason is that with large sensors come large lenses, and cameras that you no longer have in your hand (or to hand anyway). 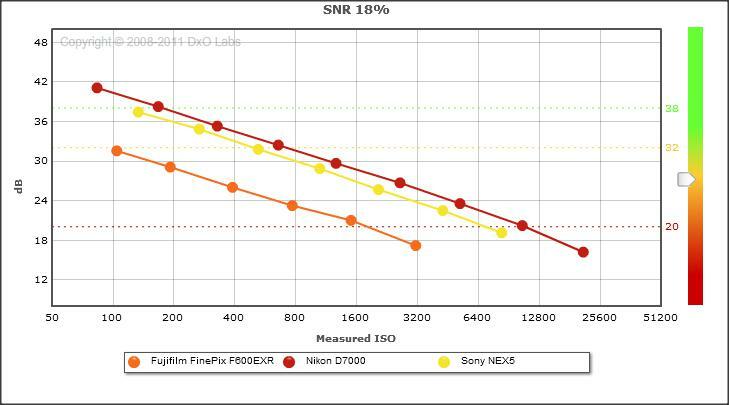 So getting the best performance from a smaller sensor is a very worthwhile goal. So if this technology is so clever, why has it not swept the world before it? Well for two reasons. Firstly, Fuji has had problems with marketing and positioning these cameras. It should be apparent from the above, that for the technology to work, you actually need to shoot at a pixel count of half the maximum (because the pixels are doubled up to take the shot). By the way, this does not mean half the resolution since, as I will show later, resolution does not depend on pixel count. However, because of the ‘pixel race’, Fuji marketed the cameras at their full resolution – i.e 16 Mega pixels (Mp) for the two cameras I use. Secondly, instead of making the 8Mp mode the default in the camera controls, it provided it as just one of the many options available. As a result, most users and almost all testers run it at 16Mp, and don’t use the EXR settings correctly if at all. So for almost all lab tests (done on the standard auto at 16Mp), the Fujis do not look different from the rest of the pack. 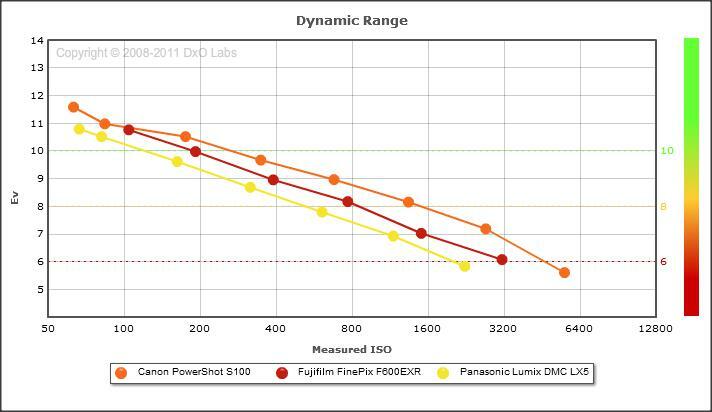 This was compounded by Fuji issuing the F550EXR (the predecessor to the F600EXR) with variable lens quality control, and that also impacted test results, and sales. The quality problems seems to have gone away with the current crop of cameras, as the bulletin boards and forums show, and as confirmed by my own testing. As a matter of interest, even without the EXR functions, these cameras punch well above their weight. The doyenne (they are French) of camera testing is DXO labs, and they do a comprehensive suite of tests of the basic sensor capability of all serious cameras. Here is the F600 (currently priced at £160 on Amazon) compared to the current leader of the pack in compact cameras, the Canon S100 (with a sensor 43% bigger by area than the Fuji and £350 on Amazon), and its rival the Panasonic Lumix LX-5 (60% bigger sensor and £330 on Amazon). The first chart is sensor noise measured at the industry standard reflectance of 18%. The higher the line the better. The second is Dynamic Range. Here the higher the line is also the better. The Fuji sits in the middle – a really respectable performance, against the two best reviewed cameras of the present time. But wait! DxO used the standard settings, not the EXR settings for these tests. Had those been used, the 2 stop advantage of EXR would have pushed the little F600 well above the other two (by the way – no getting away from it, the Canon S100 is a stonking camera, but on the other hand it’s very expensive). By the way, this may be an obvious point, but what do these charts tell us is the most powerful way to improve picture quality? Keep the ISO low! So does the EXR system actually work? When tested by a lab that understands the above points, it does very well. It got a full 5 stars in this Expert Reviews test for example. It’s not difficult to set up a Fuji correctly to get really good results, and the guru on this is the estimable Kim Lektman, a Canadian technology buff, and one who has been a staunch supporter and investigator of the technology for many years. This link provides all you will need to know about how to set up the cameras. Endless debates roll on on the forums about how and if the various aspects of EXR actually work, and Fuji are badly at fault by being extremely opaque on the specifics. Having said that, here is an example of someone getting 3 stops out of a picture by using EXR settings properly. Specifically, the ‘correct’ exposure settings for a London scene were then overexposed by 3 stops, and it was clear that the blown highlights could be pretty much fully recovered. I’ve experienced this kind of improvement myself, and can confirm the effect. Finally let me put this into perspective. You cannot perform miracles with small-sensor cameras. 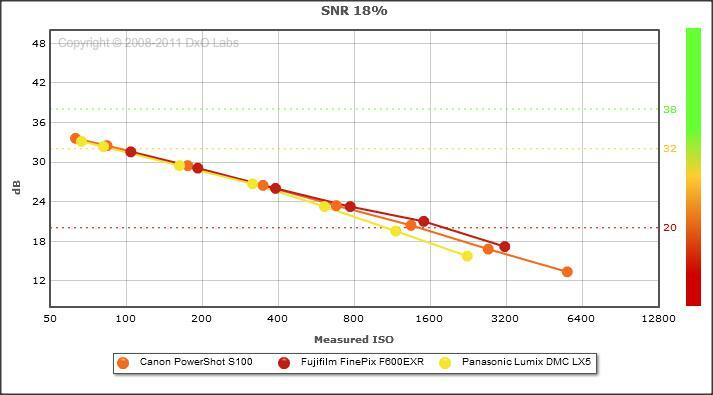 Here is the F600 (and as you saw above, the Canon and Panasonic are very similar) compared on the same DxO benchmarks to the APSC sized Sony Nex-5, and Nikon D7000. As they say in boxing, a good little’un is always going to lose out to a good big’un. But what is critical for me is to be able to take photographs with the camera I have to hand. When you know in advance that you are going to need a camera, and the shot is important, the big’un is best. But when you don’t know in advance, the little’un in your hand is better than the big’un in your cupboard. And the EXR technology makes my Fujis some of the best little’uns around. In the next post in this series, I’ll take a brief look at the Z900 and the F600, and finally show some of my own test results.